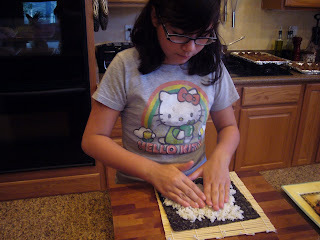 Cooking With The Kids: Kanpai! Sushi Night! 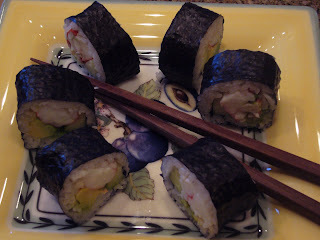 Sabrina made sushi last night! Now there's something I never thought we'd make at home! It's just rice, seaweed, vegetables and some crab (not the kind that begins with a "k"), so I knew she could do it! We went to Whole Paycheck to find the correct sushi rice and a piece of ahi tuna for David - sadly, the tuna is being returned today, it was tough and for that price, they can have it back! 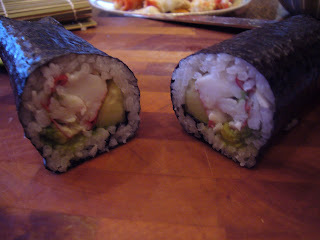 Next, laying out her fillings: fresh king crab, cucumber, avocado - sounds like a California Roll to me! We threw in some panko breaded shrimp that I found at Costco - they were great. 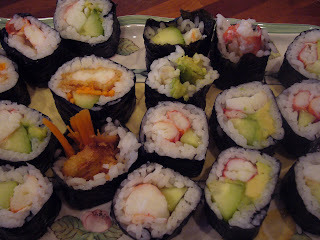 And Sabrina even ate one - she usually doesn't like shrimp but she enjoyed these! Alexander wasn't up 100% yesterday, too many late nights have led to a cranky boy, so he had teriyaki chicken with steamed rice. 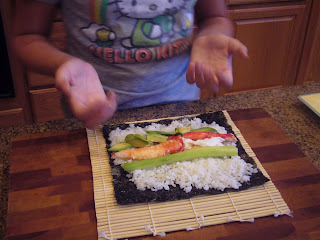 But the sushi was awesome, and Sabrina was so thrilled that she made it herself!